We’ve been all about the Lace and Openwork here at Happily Hooked lately. With team members all across the world, we’ve shared in the excitement as spring turns to summer, as kids have begun to prepare for vacation, and in our mutual love for lacework. We wanted to give you a sneak peek into The Pattern Pack, and this Lyrical Vest by Sonya Blackstone is so chic and so fun, I just had to share. I saw this and immediately thought “Bohemian Rocker Chick” and knew I had to make one. I mean… Just. Look. At. That. Fringe! So sassy! The vest is definitely a looker, and is a fantastic fashion statement. Just imagine this in color. I think I’d crochet this in a deep crimson… or even a rustic brown (can you picture it crocheted in leather strips? Do they even do that?). What about in a long self-striping ombre? What about you? 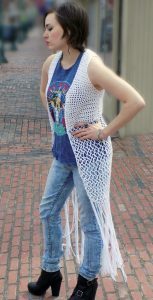 What yarn would you use to make this vest? The June Pattern Pack will go live for our Gold Members on June 1st. You can also purchase it on Ravelry, along with other great issues as well! Big Boy Blanket - #2 Sports!